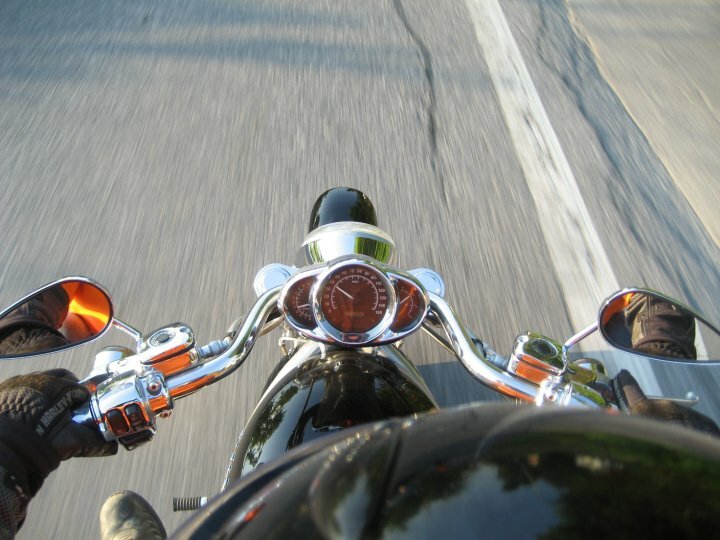 Yesterday, I wrote a short blog on a Patriot Guard mission that I was about to participate in. I kept it short as it was pretty late and I needed to get some sleep for the ride. I wanted to write more about it and try to convey the emotion and patriotism that happened during this ceremony. I left home on the bike around 8:30am to meet a friend in Clifton Park, and then head up to meet a few others at another destination. We got to the other destination and met with about 6 more bikers. Most of these bikers were Vietnam veterans, and they proudly displayed it on their vests. We left that spot and headed up the Northway to meet with a larger group of riders just before the exit for the funeral home. At about 10:45, we all fired up the bikes and headed for the funeral home. At this point, we had about 25-30 bikes. We got off the Northway and made our way towards the funeral home. About a half mile from the funeral home, you could see numerous emergency vehicles parked along the road with their lights going. On either side of the driveway, there was a huge ladder truck with the ladders fully extended. Hanging between the two buckets was an enormous American flag. I got a little choked up at this point. 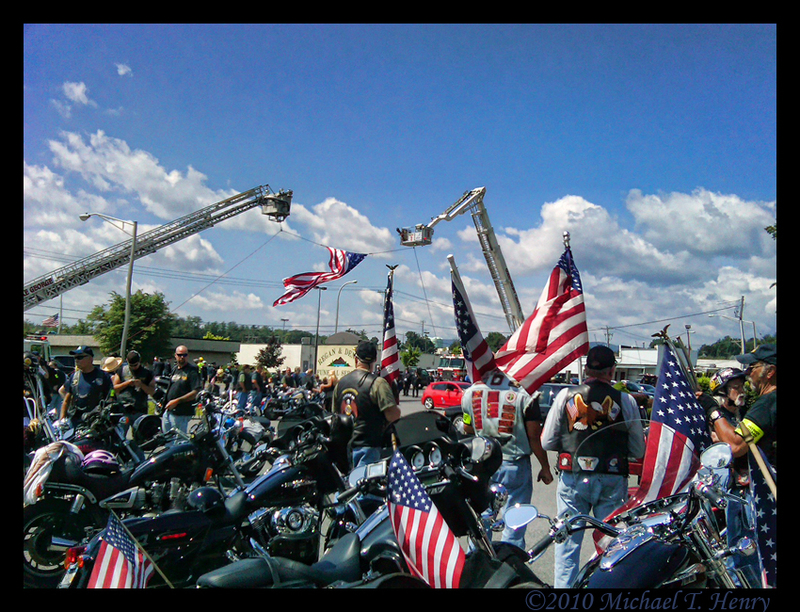 As we came in under the flag, there were already 60-70 bikes in the parking lot. There were also about 10 local and State Police motorcycles lined up to lead the ride. About 15 minutes after we got there, we got the call to mount up and everyone got on their bikes. I was in the back at this point, so I couldn’t see the casket come out to the hearse. As they brought it out, a bagpiper began to play. Just as he began to play, it started raining. It was a little eerie. The police bikes left, followed by a few fire trucks and then the Patriot Guard riders. It was raining pretty good at this point, but it didn’t matter. It also didn’t matter to the hundreds of people lining the side of the road with flags in their hands. Many of them held their hands over their hearts. The amount of people standing there in honor of this fallen soldier blew me away. The ride went through many small towns, and in each town, there were hundreds of people standing alongside the road. I honestly thought it would be just in town near the funeral home, but it lasted the whole ride. The ride to the cemetery was about 45 minutes to an hour. At one point, in the town of Kingsbury, we came to a bend in the road and they had two ladder trucks set up and another huge flag hanging over the road that we all rode under. It was another point that got me a little choked up. When we got to the Saratoga National Cemetery, the Patriot Guard quickly dismounted our bikes and took our flags to stand a flag line for the service. The turnout for this fallen soldier was incredible. It was nice to see the huge turnout. I am sure it meant a lot to his family. Rest in Peace Spc. Osborn. LAKE GEORGE, N.Y. — A local soldier serving in Afghanistan died in combat Wednesday, adding to one of the deadliest months for U.S. forces during the Afghan war. According to family members, U.S. Army specialist Benjamin Osborn was in the midst of a conflict with the Taliban when he was killed. Osborn, who was 27, had volunteered to be the gunner and was the only one killed in the conflict. Osborn’s parents were informed of his death Wednesday morning. Osborn was a 2002 graduate of Lake George High School. Recently, he had been living in Clarksville, Tennessee where he was stationed at Fort Campbell. He was just deployed to Afghanistan two months ago, in April of this year. He had previously served 15 months in Iraq. Osborn was also just recently married back in February. The flag is now at half-staff at Fort William Henry in Lake George. His family says he died a true hero. June is shaping up to be one of the deadliest months for U.S. troops in the nearly 9-year-old Afghan war, as insurgents have stepped up attacks in response to a NATO push into Taliban strongholds in the south. The deadliest month for U.S. troops in Afghanistan was October 2009, when 59 Americans died, including seven soldiers killed in a single clash near Kandahar and seven who died in a helicopter crash in the northwest not caused by hostile fire. In the east, meanwhile, three Afghans working for a private security company were killed when their vehicle struck a roadside bomb in Muqar district of Ghazni province, according to the deputy provincial police chief, Nawroz Ali Nawroz. Nine Pakistani militiamen were apprehended before dawn Wednesday inside Afghan territory in Kunar province, provincial Police Chief Khalilullah Ziaye said. The Pakistanis said they fled into Afghanistan to escape attacks by the Pakistani Taliban against four of their checkpoints, Ziaye said. The nine remained in custody Wednesday pending an investigation, he said.